From different motivations and initiatives, from the ABPI, we propose the third Symposium Transpersonal in Boca del Rio, Veracruz, Mexico, port of entry to the Americas. This time organizations of the Americas, North and South America, Europe, Asia and Africa will gather to celebrate a new meeting whose motivation, this year, Inner Peace be indispensable foundation for not less utopian, World Peace. In addition, this event will allow the meeting of the various Governing Councils of the various major world Transpersonal Associations. Transpersonal Psychology professionals as well as academics, students and the general public attended, in the beautiful setting of Hotel Mocambo, facing the warm tropical beaches of the Gulf of Mexico, on 27 and 28 January 2018. 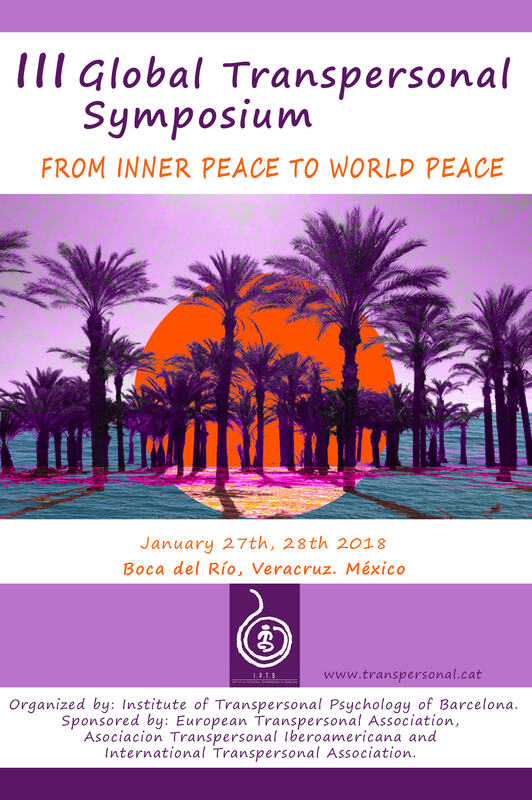 We are pleased to invite you to the 3rd edition of the Global Symposium Transpersonal Psychology Institute ABPI Barcelona to be held next year 2018 from 27 to 28 January in the beautiful city of Boca del Rio, Veracruz, Mexico. This symposium is sponsored by the European Association of Transpersonal Psychology EUROTAS, the Asociacion Transpersonal Iberoamericana ATI, the Association for Transpersonal Psychology ATP and the International Transpersonal Association ITA, associations whose main objective is to promote Transpersonal Psychology and interaction between / as psychologists / and scientists as / as. 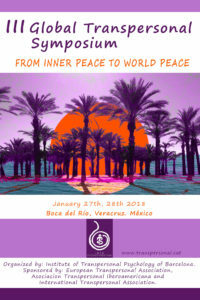 Under the slogan of «inner peace to world peace» we offer reflect, around different themes that organize and converge on our third Symposium and constitute a challenge for contemporary Transpersonal psychology that develops in our Americas; fostering dialogue conducive to addressing the problems and needs of transpersonal areas. We have each and every one of you to meet these challenges. For those who make up the organizing committee of this event, it is a huge commitment to offer a space of reunion, of critical reflection and creating proposals to encourage and strengthen the efforts of Transpersonal Psychology worldwide. We are working together with universities and institutions around the world, the country and the region, to stay in Boca del Rio, Veracruz, is a highly enriching experience. We have the participation of speakers from more than 20 countries all belonging to the transpersonal field. This exciting and challenging symposium aims to be a forum, discussion and networking for academics, researchers, professionals, educational leaders, advanced students, practicing spiritual disciplines and all those interested in the spiritual dimension of the human being. The place we have chosen is the legendary Hotel Mocambo was built in the 1930s against the tropical beaches of the Gulf of Mexico. We will have a conference room and accommodation in the same place, the hotel is easily accessible from the airport. We look forward to your pace, atmosphere and the warmth and hospitality of the boqueños (Boca del Rio) and jarochos (Veracruz). We wait on 27 and 28 January 2018 in the emblematic city Boca del Rio, Veracruz Mexico, where all of you are very welcome. Transpersonal Psychology and Peace in the World. Symposium official languages ​​are Spanish and English. The general theme for the two days will be of inner peace to world peace. Conferences and roundtables taught by veteran founders of the movement of Transpersonal Psychology. Bernadette Blin , President of EUROTAS . IRETT Director, Institute for Research and Studies in Transpersonal Therapy Paris (Transpersonal Training Institute). Transpersonal psychologist, psychotherapist, teacher, author several books. Professor at the University of the Andes in Merida, Venezuela, and instructor Shanti Maha Sangha in Dozgchén community. Author of several books on philosophy, psychology and other disciplines Buddhism. Founding member of the Transpersonal Association Iberoamericana, ATI. Professor at Sofia University Palo Alto. California. Transpersonal and Shamanic counseling and dream work. Teaches workshops internationally. Co-president of the Error! Hyperlink reference not valid. , ATP. Psychologist and Psychotherapist, pioneer in the introduction of Transpersonal Psychology in Spain, holotropic breathing, member of the Board of EUROTAS. ABPI Director of the Institute of Transpersonal Psychology in Barcelona, Professor at the University UOC. Jungian psychoanalyst l, formed in somatic movement BodyMindCentering works with voice, deep and Transpersonal Psychology. is a pioneer of transpersonal studies in Russia, founding member and President of the Russian Association for Transpersonal Psychology and Psychotherapy, Chair of Transpersonal Psychology at the Moscow Institute of Psychoanalysis. Member of the Board of EUROTAS Psychologist, transpersonal psychotherapist, teacher, author several books on healing practices in different cultures. Pier Luigi Lattuada , MD, Ph.D. Founder of the Biotransenergetica. Board member of Eurotas (EUROTAS Transpersonal Training Institute) transpersonal Psychiatrist, Psychotherapist, Professor at the University of Milan., Author of several books. Board member of Eurotas (EUROTAS Transpersonal Training Institute) Psychotherapist, Professor in transformational psychology. Director of the Association for Transpersonal development of Moldova. President of Latvian Transpersonal Psychology and Psychotherapy Association, Director of Transpersonal Education Institute in Latvia. Visual art, therapy, meditation, visualization, mandalas, drama therapy and spiritual. Psicologo President of the Estonian Transpersonal founder and director of SACH International Association. Hypnotherapy School analytical and cognitive psychotherapy. Jure teaches internationally. Doctor of Fine Arts from the Complutense University of Madrid. Bachelor of Fine Arts from the Universidad Veracruzana. Member of the Center for Gender Studies at the University of Veracruz. Transpersonal Coach, Expert in shamanism, member of the Board of EUROTAS. ABPI member of the Institute of Transpersonal Psychology in Barcelona. Juan Diego Duke University psychologist Martinez del Valle (Cali, Colombia) and Master in Interventions in Psychotherapy at the University of Salamanca (Spain). Isaac Calderon studied psychology at the Technological Institute of Higher Studies of the West in Guadalajara, made a Rebirthing with SondraRay certification and training Coaching, Psychotherapy and Dance Primal School of Psychology transpersonal Integral. Psychologist and psychotherapist, 36, Colombia, lives in Berlin, Germany, transpersonal psychologist. Yoga, different types of meditation, Biodanza, Reiki, close contact with Native American traditions. This way of Transpersonal Psychology Stanislav Grof on different continents, and becomes a certified Holotropic Breathwork practitioner. Pascal K’in Greub, Swiss, healer and speaker worldwide for 17 years learning the Galactic Maya in Mexico, will make you understand the background of the Invisible Healer © -of this philosophy and methodology of collective healing for any human being. Faculty of Humanities Charles University, Prague Academy of Arts Architecture and Design in Prague. Film director films Cultures Specialized native of Tibet, Peru, Mexico, Turkey. practice dancing and singing. Graduate School Naciente Theater School Studies Institute of Arts (Contemporary Dance) Visual Arts Matanzas, Margi kathakalhi India Kerala Dance Theater School, Ista International SeminarKopenhagen Odin Theater in Denmark. Mario Alonso Martinez Cordero The workshop focused on ectstática propongoestaría dance as a non-ordinary state of consciousness, inspired by butoh dance, shamanic trance, experiences with ayahuasca and possession cults of the Yoruba and Umbanda. The idea is to become aware of the unconscious forces that move us through certain bodily exercises in relation to the instinctual drives. Transpersonal psychology expert, learned of Mexican shamans, Uzbek healers, wise Aymaras, Cuban Santeria, Lobi sorcerers .. and wordless book Tarot is my main tool. Born in 1958 in Remscheid, Germany, has two children, studied Anthropology and Psychology (MA), Grof Transpersonal Training (GTT), training advanced as a teacher, spiritual healer (OLHT), transpersonal psychotherapy (Ingo Jahrsetz, Rainer Pervöltz), focused psychotherapy the person (Uni Freiburg). Teacher in a school of psychotherapy-Professional in Freiburg. European Transpersonal Psychotherapy Certificate (ECTP). Transpersonal president of the Forum. Lives and works in Freiburg as an individual therapist and facilitates workshops holotropic breathing since 2002.